It’s the smallest show right now at The Met. It doesn’t even have its own web site. 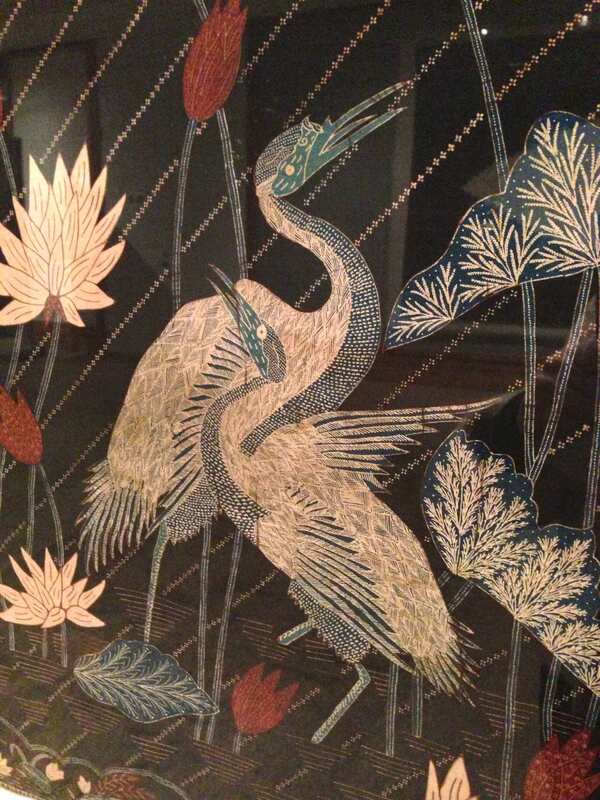 If you’re on the way to see Matisse on the First Floor, pause to take a close-up look at some marvels of the textile collection and imagine you’re on the faraway Indonesian island of Java in the micro-show, Resistance and Splendor in Javanese Textiles. The curators have framed a collection of textile masterworks from that exotic corner of the world, mostly sarongs. If you read the label copy, the series of textiles embellished in the resist-dye technique evoke quite a bit of the recent history of Indonesia. Everyone knows batik, but you may not know that it was cultivated as an export by the Dutch in colonial times on Java (formerly Dutch East Indies). Or that there were workshops whose fabric designs were as identifiable in 1890s Java as 1990s Versace prints are to us. Small detail of wrapper in Hokokau style (early-mid 1940s). Traditional motifs on diagonal with European-style flowers. As demand grew throughout the 20th century, designs changed, adhering to tastes of foreign buyers, even while the resist-dye masters kept mashing in the iconography of ancient Javenese royalty. 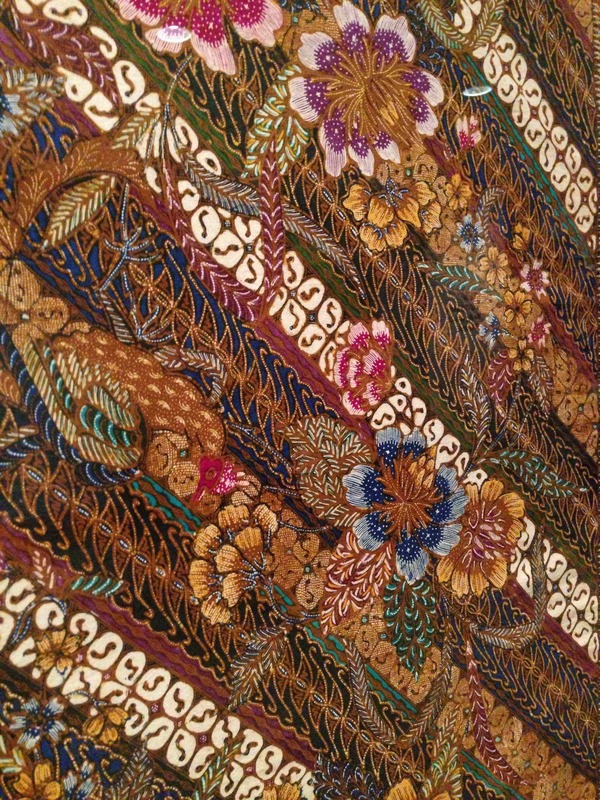 As the curators mention, it’s particularly poignant that some of the most intricate, beautiful resist-dye textiles were made under the difficult WWII Japanese occupation of Indonesia. Apparently cotton shortages allowed the master craftsmen to spend more time perfecting elaborate techniques. The intricacy, dynamism, and history of this textile display is something you really need to see up close. Thank you, Ratti Textile Center vault. This entry was posted in Art, Fashion, History, Museums and tagged arts, culture, design, fashion, history, museums, style, textiles by mssusanb. Bookmark the permalink. Of course Matisse loved textiles so I definitely think everyone should stop and see this. Matisse would have made a bee line!!!!! Thanks, Arlene! I completely agree, and your comment reminds me about the show that featured some of his woven inspirations. If you haven’t seen it yet, the famous blue dress is included in the current Matisse show. What a great idea!